Carter Beats the Devil, by Glen David Gold, was one that was recommended to me by a work colleague. She described the book to me and a bit about the characters, and I knew I had to read it. Rather than just getting it from the library, I bought it. I don’t normally just buy books based on other people’s opinions, but I think I had a ‘ah, what the heck’ moment and just went for it. I’m so glad I did. This one will be one I re-read at some point, for sure. 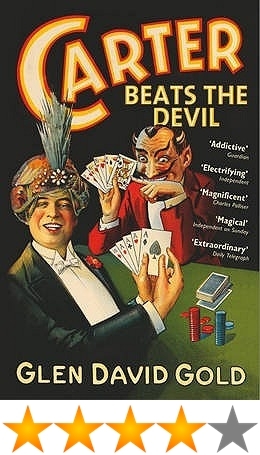 Set in the early 1900s, Carter Beats the Devil tells the story of Charles Carter, a magician, and his journey through the ups and downs of trying to make it in the magic business. I found that there were two sort of key events in the book. The book starts off at a similar time to when it finishes, and then jumps way back in time and continues from there. If that makes sense... The first chapter tells the reader two things: 1) Carter has bet the devil in his final performance of the night and 2) the President was found dead, just hours after seeing Charles Carter’s show. After these key points are established and the questions are raised (did Carter kill the President? How does he beat the devil? etc), the story splits into sections. Some chapters are from Carter’s perspective; some are from that of the detective investigating the President’s death. The language used is very fun to read, and though it’s long, the words used and the descriptions of things are such that it doesn't really feel as long as it actually is. That probably doesn't make sense…just go with it. With mysteries and questions, a lion called Baby, a disappearing elephant, a sceptical brother, a woman called Sarah, and a whole lot of magic, Carter Beats the Devil is great read. The characters were fun – and some, of course, were horrible – and there was a good amount of humour as well as the serious stuff. There were a few chapters near the beginning that I didn't think were all that necessary – details about Carter’s life when he was very small, that I didn't really seem to link with the future/present Carter – but overall it was very clever, captivating and extremely well thought out. I think I will definitely be paying attention to more of the books my colleague suggests in the future.